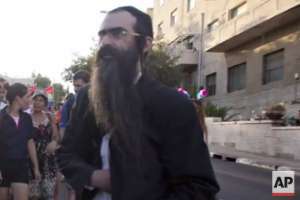 The ultra-Orthodox man suspected of stabbing six people during last month's Gay Pride Parade in Jerusalem was charged with murder on Monday. One of the victims, 16-year-old Shira Banki, died from the wounds she received during the attack. According to news website Ynet, Yishai Schlissel (also spelled Shlisel), 39, lashed out during his appearance in court on Monday. “The pride parade must be stopped in order for the soul of Shira Banki to ascend to heaven,” he said. EFE reported that Schlissel is also charged with aggravated assault and six counts of attempted murder. He has already served a 10-year prison sentence for attacking 3 people who participated in the city's 2005 parade.